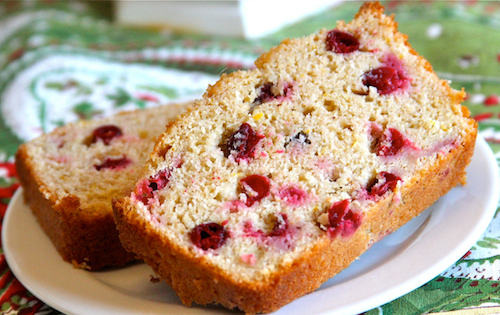 This is a moist cranberry quick bread with a faint hint of orange flavor that is perfect for the holiday season. The juicy tartness of the fresh cranberries is complemented well by the citrusy flavor of orange. I personally like the tart taste of the cranberries but if you prefer a sweeter loaf, do add an additional ¼-cup of sugar or use a sugar replacement for the remaining sugar. The addition of turbinado sugar at the end, adds a little crunch to the top of the loaf and some sweetness with every slice. This recipe is a modified version of one found in the “Silver Palate Cookbook” by Julee Rosso and Sheila Lukins. It is great fresh from the oven or even better after it has sat for a day and is also great toasted. The fat in this recipe is significantly lower than the original recipe and yet retains a moist texture with the addition on yogurt. Orange zest and the addition of spices like nutmeg, cinnamon and ginger add flavor to offset the decreased fat. The addition of whole-wheat pastry flour adds nutrition. Cranberries are a nutritious super food and have high concentrations of vitamin C, fiber, manganese and vitamin K. Cranberries, like their relative the blueberry, also contain an abundance of antioxidants. An orange flavored loaf studded with cranberries. Coat a 9x5 inch loaf pan with cooking spray and set aside. In a medium sized bowl, combine flours, sugar, baking powder, cinnamon, ginger, nutmeg and salt. In a small bowl, whisk together the juice, egg whites, butter and yogurt until well combined. Make a well in the center of the dry ingredients and pour in the wet ingredients. Stir until just combined, then add cranberries and walnuts if using. Stir just to combine; do not over mix. Sprinkle turbinado sugar over the top of the loaf. Bake for about 50-55 minutes or until a skewer inserted in the middle of the loaf comes out clean.